The Pens have flown west and left the stench of the January’s games behind. Geno is back and with him comes the skill and big ice presence he brings. The team is OK...right? We can all speculate about what’s wrong with the team and offer suggestions of how to get things back on track. In the end, there is no solution any of us can conceive that the coaches, players or management haven’t tried or considered. The Pens have reported 222 man games lost to illness or injury. They went from having the number one power play to number six at 22.2%. Marc-Andre Fleury went from being one of the league leaders to the middle of the field with 2.36 GAA. The Penguins have scored just twice in their last three games, both in an overtime win at New Jersey on Friday in which they took 43 shots. It’s all been a bit much, hasn’t it? There are man games lost and then there are man games lost. I think those tallied by Olli Maatta and Pascal Dupuis have had a significant impact on the team. We marveled at the poise 20 yr old Maatta displayed in the face of thyroid cancer and breathed a collective sigh of relief when he returned to the ice as if nothing had happened. But fate is a cruel mistress and we lost young Olli to a shoulder that we all assumed was fixed. Speaking of cruel, losing Duper to a blood clot after he did everything right to come back from his knee injury, has been almost too much to bare. The resident prankster and unquestioned heart of the team is out for the year and maybe forever. Need proof that he isn’t just another injured player? The Pens created a coaching position for him to keep his persona a part of the team. Some players make their biggest impact on the score sheet making it evident exactly what they bring to the team’s success. 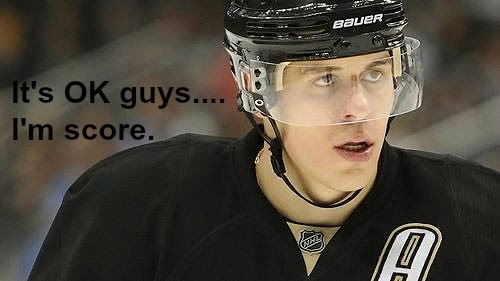 Sidney Crosby is counted on to be such a player for the Pens. We’ve come to expect that in all situations he will pick the team up and carry them on his back into the playoffs. But he’s had his own issues and just 6 goals in 26 games….and MUMPS! How does a childhood virus ravage a roster for over a month? Don’t lose sight of the fact that all of this has occurred during the first four months of a coach in his rookie NHL season. Mike Johnston has faced trials that would have given Job pause to look to the heavens and ask, “Why me?”. He’s patiently gone from the business of implementing his system to adjusting to losses from injury and illness all the while managing to find enough healthy bodies to throw on the ice each night. Johnston’s true test lies ahead of him. Health, confidence and skill will ultimately realign; Comeau and Ehrhoff are healing even as we speak. This trip out west will be positive for the team. Pucks will find their way to the back of the Pens’ net. Crosby's scoring prowess will benefit from a guy who is able to hold the puck like Perron can, even as he benefits from Hornqvist's center drive that opens lanes for both him and Perron. 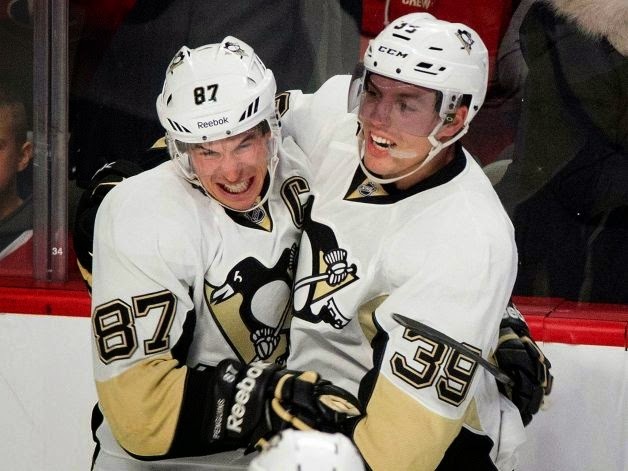 Chris Kunitz and Geno will reignite their chemistry. Downie, Sutter and Bennett will mesh to find a grit and scoring ability that will make the third line a force to be reckoned with. And that's how the West will be won!